ESE Direct > Articles > Eye, eye! whats in an eyewash kit? 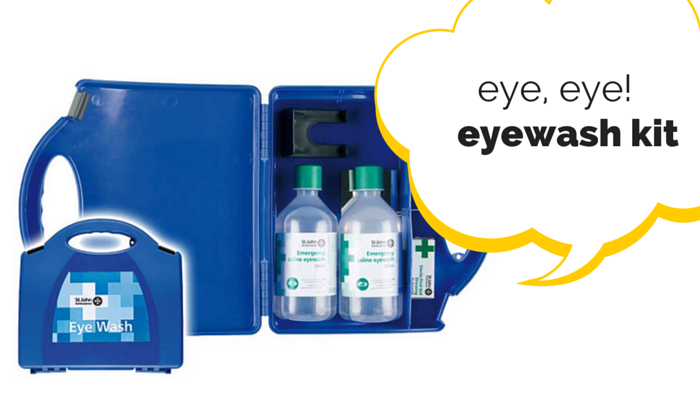 No matter what kind of job you do there is always the risk of getting something in your eye, which can be irritating and sometimes very dangerous, the best way to deal with any incidents is an eyewash kit. The Health and Safety Law advises that you should be prepared for every eventuality (apart from maybe a zombie apocalypse) so that your employees and visitors can do their job and visit your premises with peace of mind. Dust and debris are an avoidable part of life in general, from that annoying eyelash in your eye to more serious debris like specks of concrete which can seriously scratch and damage your eye. Most objects which get caught in your eye can actually be washed out quickly and easily without any specialist help, and this is where the eye wash kit really comes in handy, and can be used by yourself or if you have a certified first aider to hand. The kit contains all the necessary items needed to ensure that your eye health remains top. To bathe and rinse any dust and debris out of the eye quickly and comfortably. Which are sterile to protect the eye whilst you wait to see the doctor or GP, and also keep any more dust and debris from entering. Well this one is self-explanatory, it is so you can see what you are doing! In case you want to mount the kit onto the wall to save on storage space. If you do have any questions about the eye wash kit, or any of our products please do not hesitate to call our customer service team on 03333 316 083, who will be happy to help!